A year ago, Pebble had been rejected by a host of venture capitalists for the smart watch it wanted to build, so it posted the idea on Kickstarter. I don’t have to tell you that worked really well. At $10.2 million and almost a year later, with 70,000 of 85,000 Kickstarter watches shipped to backers, and thousands more preordered on its own site, Pebble is returning to take venture capital on its own terms. The company has now raised $15 million, largely from Charles River Ventures, led by CRV partner George Zachary. Asked whether he would have changed anything about the Pebble design if he had access to this kind of capital from the start, Pebble CEO Eric Migicovsky said he doesn’t think so — just that production and hiring might have been quicker. So why did venture capital bite this time? 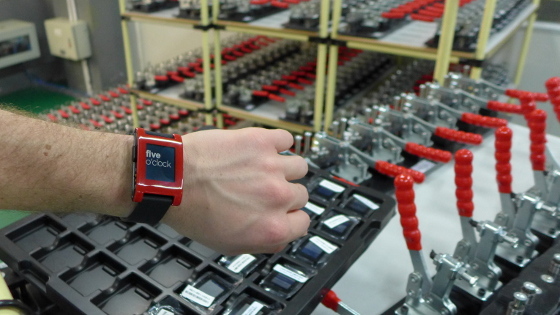 Just because wearables are so hot right now? “I just think they have a big lead. The revenue run rate is very substantial,” said Zachary, who usually invests in Web startups like Twitter and Udacity. He added that this, his largest Series A investment ever, brings him back to his roots working on Nintendo 64 at Silicon Graphics. “Eric thinks the battle will be won with the developer community, so I decided to take a risk on that specifically,” Zachary said. That’s not to say Pebble is a sure thing — not at all, since Apple and others are expected to soon compete for wrist real estate with devices of their own. Not to mention competition from Google Glass, the other wearable device that’s making waves now. Zachary said he’s skeptical that people will want to wear computers on their heads, something he worked on 20 years ago at virtual-reality pioneer VPL Research. As for competing on the developer front, Pebble is releasing staged access to functionality that’s already in the watch. Developers can make their own watch faces and games (5,000 of them so far, installed 300,000 times), and as of today they’ll be able to rig up two-way communication with smartphones. That should open up space for people to build things like emergency apps (e.g., press two buttons to send GPS to loved ones) and to-do lists, Migicovsky said. Also: Weather, traffic, stocks and Bitcoin prices. “But we’re more interested in the use cases we haven’t been able to predict,” he said.